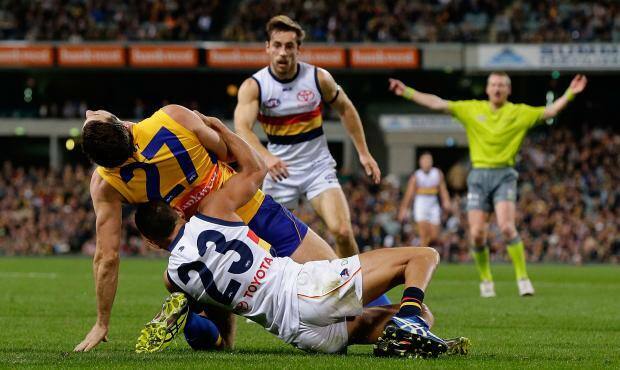 A dominant fourth quarter was the difference for the Crows, outscoring the Eagles 6.5(41) to 0.0(0). 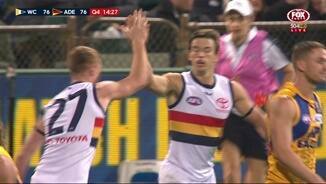 Adelaide has kicked 4.3(27) from West Coast turnovers, three of the goals were launched in the defensive midfield. The Eagles have managed only two inside 50s in the term and Adelaide has 14. The ball has been in the Crows' forward half for 84 percent of the final term. Adelaide has had a fast start in the final term, it leads contested possessions 21 to eight, inside 50s nine to one and have kicked three goals to zero. 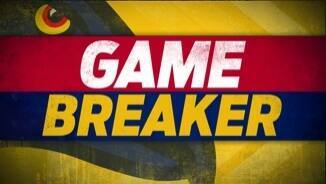 Adelaide lead ball up and throw in clearances 24 to 16 however the Eagles lead centre bounce clearances 12 to seven. 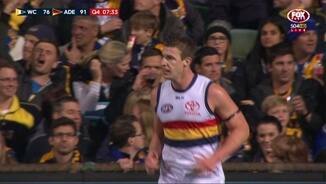 Crows InterchangeSam Jacobs off due to an injury. The Crows have played on from 34.6 per cent of marks tonight, they have played on from 34.3 per cent of marks in 2016. The Crows lead third term clearances nine to four and the total game count is now equal at 26. West Coast has generated four scoring shots from six inside 50s this term and the Crows have had two scoring shots from 10 inside 50s in the third quarter. The Eagles have taken eight marks inside 50 to four, Josh Kennedy has three. Jeremy McGovern has taken five intercept marks, his most in 2016 is six. West Coast has scored 22 more points from stoppages than Adelaide, they average a differential of plus 10 points per game. Second quarter inside 50s are now nine to three in Adelaide's favour. Despite Adelaide's dominance early in the quarter, both teams have one goal each. In the second term, the Eagles have managed only two disposals compared to Adelaide's 22 in the forward half. In the first six minutes of the quarter, the ball has been in the Crows' forward half for 82 per cent of the time. In the last 10 minutes, the Eagles lead disposals 42 to 14, inside 50s five to one and have kicked 3.1(19) to nothing. All four of the Eagles' goals have been launched from Adelaide turnovers. They are ranked fourth for points from this source averaging 60 points per game. Adelaide's first three goals have been launched from defensive 50 chains, they are ranked first in scores from this source averaging 48 points per game. The Eagles have entered the forward 50 four times and kicked four points. 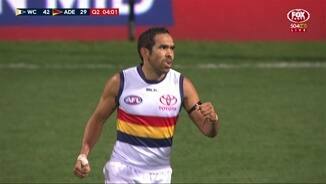 Eddie Betts kicks the Crows first goal from their first inside 50, they have kicked a goal from 30 per cent of their inside 50s this yearranked first. The Crows are putting pressure on early, laying nine tackles to one. West Coast and Adelaide are ranked first and second respectively for their kick to handball ratios. West Coast average a ratio of 1.35 kicks to handballs and Adelaide's is 1.31 kicks to handballs. The Crows have launched 48 points per game from defensive half chains which is the most of any side. Welcome to Domain Stadium for the West Coast Eagles v Adelaide Crows Round 12 clash. ADELAIDE has confirmed its top-four credentials with a stunning second-half comeback to inflict West Coast's first loss at Domain Stadium this season. The Crows were 26 points down 15 minutes into the third term but rallied to kick the last eight goals of the match, running out 15.15 (105) to 11.10 (76) winners. 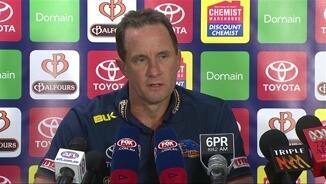 Crows coach Don Pyke said the win had significant implications for their season. "In terms of the context of the year the difference between 7-5 and 8-4 is not to be overlooked," Pyke said post-match. "From a belief view point it helps in terms of the journey we are on. "The guys now get a real feeling of what they are able to create as a group in any circumstance. "At quarter-time, it's fair to say we had some challenges, and they responded." No interstate side had come within 62 points of the Eagles in Perth this season, but the home side's staggering second-half fade-out now puts their top-four pursuit in jeopardy. 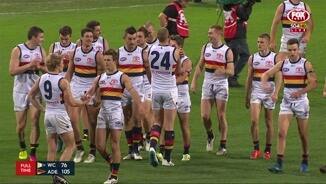 They failed to register a score in the last quarter as the Crows piled on 6.5 at the other end. 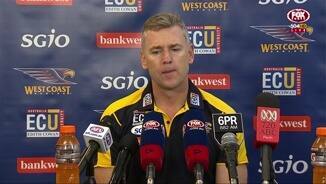 "We were disappointing in the last quarter to say the least," Eagles coach Adam Simpson said. "I didn't really see it coming. "To be two goals up at three-quarter time … I think we had three inside 50s in the last quarter. The stats blow you away. There were some small signs at the back of the third quarter, but the game was sort of doing that a little bit. "But that last quarter… I didn't see it coming. It's really disappointing." Rory Sloane was inspirational in the last term. He gathered 11 possessions, nine contested, had four inside 50s and three score assists. He finished with 29 disposals for the match. 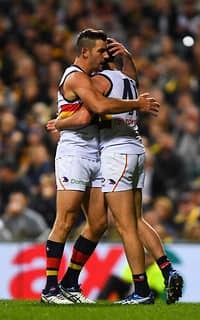 Eddie Betts was a star up forward with five goals, while Josh Jenkins finished with three and Scott Thompson gathered 24 touches to go with 12 tackles. Matt Priddis fought all night for the Eagles with 29 disposals, gathering 16 contested possessions and laying 12 tackles. Jeremy McGovern was excellent in defence and Elliot Yeo was dynamic in the first half, finishing with 18 disposals and two goals. 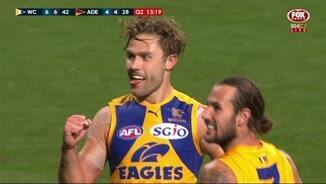 Josh Kennedy kicked three goals but he exemplified the Eagles' fade-out with just one possession in the second half. The Crows kicked the first three goals of the game but the Eagles dominated the rest of the first half. They led the contested possession count by 11 at the long break and had set up a 19-point lead. 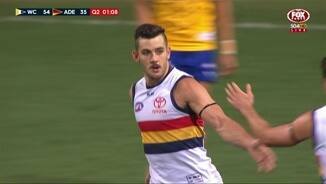 Crows skipper Taylor Walker was denied a goal at the start of the second quarter after a bizarre goal review. He appeared to have the last touch off the boot on the goal line, but it was confirmed a point on review despite video evidence suggesting it should have been a goal. But it did not impact the result. If the Crows hadn't dropped two marks in the third term that cost goals the Eagles might not have kicked another major for the match after half-time. The Crows had 40 inside 50s to 12 in the second half as the Eagles struggled to move the ball out of their defence. The Eagles earlier had two costly late withdrawals. One came prior to the teams being submitted, but the other just moments before the opening bounce. Eric Mackenzie was ruled with illness when the final teams were named with youngster Tom Barrass coming in for just his fourth game. Sam Butler's withdrawal came moments before the opening bounce after suffering a groin injury in the warm-up, and the Eagles were able to replace him with emergency Xavier Ellis. West Coast: Mackenzie would be expected a good chance to be ready for the Eagles' next match but there may be concerns over Butler’s groin injury coming good in time. "(Mackenzie) was just crook," Simpson said. 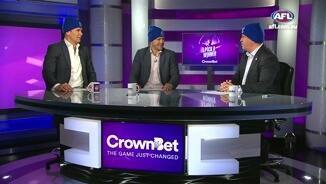 "There's a bit of a virus getting around at the moment with our players. So he was unavailable and then we lost Butler right before the game. But I don't think that had any bearing on the result." 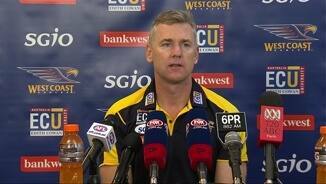 Adelaide: The Crows did not suffer any injuries. 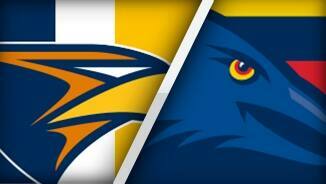 The Eagles head to the Gabba to face the Brisbane Lions on Saturday afternoon. The Crows have the bye ahead of a meeting with North Melbourne in round 14. West Coast: Kennedy 3, Darling 2, Yeo 2, Hill, Hutchings, Gaff, Duggan. West Coast: Priddis, Yeo, Gaff, McGovern, Hill, Shuey. Adelaide: Sloane, Betts, Thompson, Laird, M. Crouch, Talia, Jenkins, Lynch. 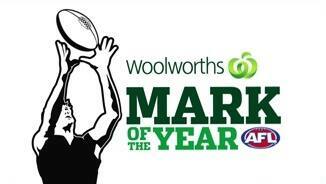 West Coast: Mackenzie (ill) replaced in selected side by Barrass, Bulter (groin) replaced in selected side by Ellis.